Sheron Lea Miller, age 79, passed away Monday, August 20, 2018 after an extended battle with pancreatic cancer. Sheron was born in Grand Rapids on September 29, 1938 to Maurice and Freda Mate. She was the eldest of 5 children and is survived by her 3 brothers, Richard (Nancy), James, and David, as well as her brother-in-law, David Bush. Her sister Kathleen preceded her in death in 2012. Sheron married Dale Miller on June 6, 1959. He preceded her in death December 2003. They had 4 children: Tim (Anne) Miller; Maureen (Jeff) Macqueen; Kathleen (James) Sexton; and Sarah Miller. She was a dedicated and loving grandmother, or “Maga,” as they call her, to Kari and Kelsey Macqueen, and Emily and Nathan Sexton. She also had several nieces and nephews who will miss her. Sheron was a stay at home mom back in the days before it was a “fad”. It was within that vocation that she instilled the values of hard work, respect, modesty, love, independence, and the importance of the phrase, “...because I’m the mom, that’s why!” She went to work at Steketee’s in Grand Haven where she could share her passion and knowledge of sewing with those who braved the basement level. She also worked as a secretary for the Ottawa County District and Juvenile Court systems for many years. It was there she developed many friendships and a second family vibe. (She really did love you guys.) After retiring from the Courts, she continued her secretarial skill for Van Tubergen & Treutler Law Firm. Later in her retirement, she could be found at First Presbyterian Church working and volunteering in whatever capacity needed. She also volunteered at Four Points Center for Successful Aging. Sheron was a creative and talented artist. She loved to sew, paint, and do ceramics. She was an avid sports fan. If it weren’t for growing up in the 50’s she would have been the star athlete of Lee High School! 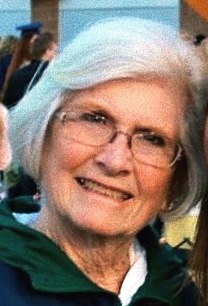 She enjoyed attending her children’s and grandchildren’s sporting events all through their school years. She was a true Buccaneer sports fan. She and Dale never missed a game. Sheron also had and passed on a passion for reading and thirst for knowledge. Her family would fight to be on her Trivia Pursuit team and rarely did she miss a date night with Alex Trebek and Jeopardy. Not only was family a priority in her life, but Sheron also had a vast group of friends whom she enjoyed spending time with. It meant the world to her. She continued meeting for lunch once a month with friends from high school, and also had a close Grand Rapids friends group that vacationed together and spent many Saturday nights together. Tuesday nights once a month she met with her Grand Haven Club. These women met once a month for decades. Sheron could be found most mornings- drizzle and snow included- walking the pier and downtown area with her walking buddies and enjoying breakfast and a coffee afterwards. A Celebration of her Life will be held on Saturday, September 29, 2018 -which would have been her 80th birthday- at First Presbyterian Church in Grand Haven at 11:00 A.M... A birthday luncheon will follow. In lieu of flowers, Sheron asked that donations be made to Pancreatic Cancer Research at; https://donate3.cancer.org or to Joyful Noise Preschool at First Presbyterian Church. Being an avid reader, Sheron also requested that people donate a book (or gift cards from the Bookman or Barnes and Nobles) appropriate for grades K-12. Her family will donate these books to classroom libraries to help build future readers and lifelong learners.